On the left, Mona Engvig, Ph.D. offers you information on eLearning, and her eLearning organizational consulting expertise. On the right you'll see information about Olaf Engvig's maritime history expertise. Mona Engvig, Ph.D. is an eLearning consultant. The buttons on the left enable you to navigate through her site. You can expand your knowledge about eLearning, (also called Distance Learning, e-Learning and online education), and contact Mona Engvig regarding a consultation to assist your organization with a variety of organizational issues. She also is available to translate a variety of texts between Norwegian and English. 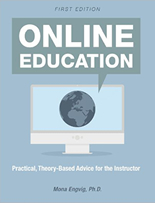 Mona Engvig's newest book, "Online Education: Practical, Theory-Based Advice for the Instructor," is designed for educators interested in improving their online teaching skills and also for anyone considering teaching online courses. "Online Education" is published by Cognella Academic Publishing, which offers classroom-tested titles for the national market that recapture the teachable moment and create a more resonant learning experience. You can purchase Mona Engvig's latest informative yet very readable e-learning book as a paperback or as a digital book. Alternatively you can save money by choosing the "Print + Digital" bundle. Want to examine the book before you decide on format? Just click on the "View Sneak Preview" button before you buy. Take advantage of Mona Engvig's many years of successful online teaching experiences and research to help you become an even better online educator. 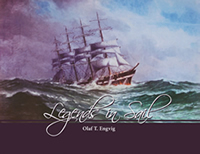 Olaf Engvig is a maritime historian, lecturer, coastal skipper, ship restorer and preserver and author of many books and articles, some of which can be seen and purchased here. 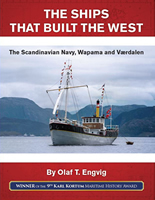 NEW HARDCOVER BOOK in English and also available in Norwegian: The Ships That Built the West: The Scandinavian Navy, WAPAMA and VÆRDALEN. This book tells the stories of the "Scandinavian Navy", namely, ships and/or seamen from Denmark, Finland, Iceland, Norway and Sweden. Learn how the US West Coast was built with the help of these ships and men, especially by providing lumber for improving the infrastructure of the US. You'll also read about the sagas and very different endings of two Scandinavian ships. The steam schooner WAPAMA once was the main vessel on display in a San Francisco museum. Then you'll experience the personal trials and tribulations over the decades of Olaf Engvig trying to rescue the hybrid ship VÆRDALEN, now the sole survivor representing the famed Scandinavian Navy lumber carriers. Olaf Engvig's The Ships That Built the West is the winner of the 9th Karl Kortum Maritime History Award, a program of the Friends of Pacific Maritime History! Olaf's previous publication is Legends in Sail ($49.95), an illustrated history of legendary ships that traveled worldwide, and gained fame for many reasons.